"Lost in a world of intricate observations from Nature"
Entranced by the cycle of growth and decay, Louisa captures the details on beautiful smooth Strathmore bristol board using ultra sharp pencils and graphite powder. It’s quiet in the studio, distanced from the world as she looks ever closer at plants, insects and birds. Texture, shadows, silhouettes and movement created with marks and tone, it’s rarely about the colour. 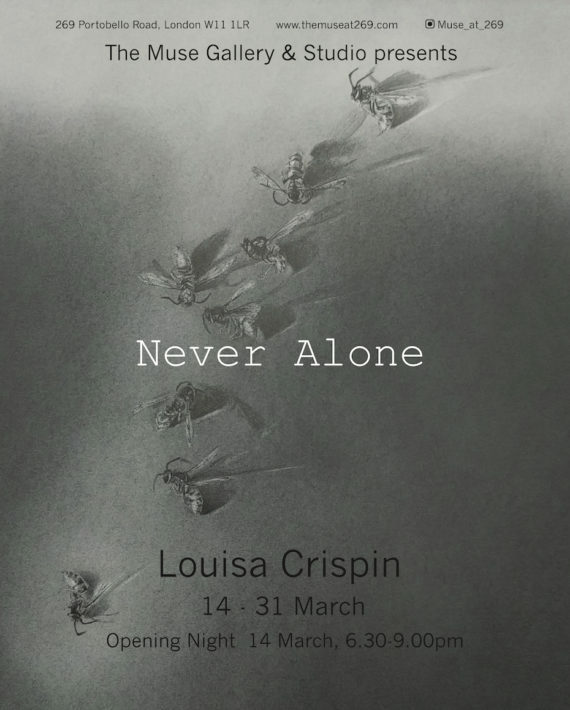 Louisa is a partner at Artichoke Gallery in Ticehurst, a member of the Free Painters and Sculptors, an associate of the Society of Graphic Fine Art and a network member of the Royal West of England Academy. Actively involved in supporting artist careers Louisa is Creative Consultant for Pure Arts Group and has links to Sevenoaks Visual Arts Forum amongst others. She regularly exhibits in London Open Exhibitions including the Mall Galleries and currently shows with Kevis House Gallery Petworth, Gallery57 in Arundel and Rye Art Gallery. It’s hard to know when an idea first germinates, what makes it grow and why it suddenly needs to flourish. The Wasp drawings began in the summer of 2017 when there was a huge nest in the loft and dead specimens lay around the house (and a huge number of live ones too!) They found a way down beside the chimney and, once the pheromone path was set, it became part of their daily flight path. We ducked as they shot across the room to the window, waiting patiently until we released them. Evenings were spent listening to incessant buzzing, a fatal attraction to light. And so the collection grew. During the drawing there is a need to learn more. Did you know that wasps eat spiders? they clear the detritus from our gardens? they pollinate fruit and overwinter yeast? The fluffy bee has a wonderful reputation, it’s time someone championed the wasp. At The Edge – ​A response to Brisons Veor, an artists residency in Cape Cornwall, finding a haven in the lanes amongst the creatures inhabiting the “cornish hedges”.